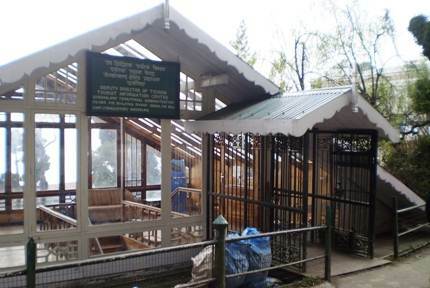 There are several tourist or visitors information centers that exist in Darjeeling and other places in India, and provide information about Darjeeling as well as lodging assistance. There are ones that are run by GTA (Gorkhaland Territorial Administration, erstwhile DGHC), an administrative body of the Darjeeling hills. The others are run by the West Bengal Tourist Development Corporation (an organization of WB state tourism department) and some by Government of India. In general the centers that are run by GTA are able to provide more detailed information about Darjeeling district because they specialize only in Darjeeling district. They also organize tours and take bookings for GTA run accommodations including the lodges and trekkers huts in Darjeeling area. West Bengal state tourism operated centers provide information not only about Darjeeling area, but other places of the state as well. From these centers, you can also do bookings for the state run tourist lodges in Darjeeling area. You can collect tourism brochures of Darjeeling and other state areas from here. The tourist centers run by the Government of India can also provide information about Darjeeling, although at a broad level because their coverage is the whole of India. You can also get brochures on Darjeeling from these centers. However they do not offer any lodge booking assistance. Below you will find the information & lodge booking centers by location, their address, contact info and their offerings. This center is in an attractive cottage type wooden and glass building located on Bhanu Sarani, which is actually the Mall road that originates at the Mall and goes around the Observatory Hill. 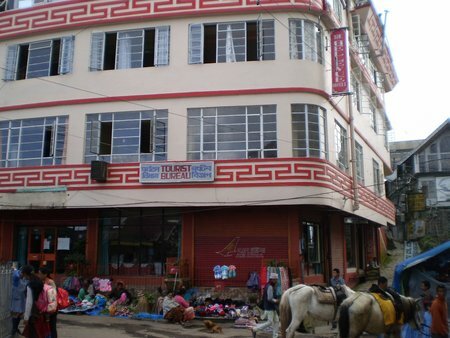 The center once organized regular sightseeing tours of Darjeeling and day trips during the high tourist season. However nowadays it only provides tourism information and brochures etc. You can also make GTA lodge reservations from here. This center was destroyed in fire and has been rebuilt. Laden-La Road, at the new car park. Walk down the Laden-La road from the Gandhi Road Police Point and you will find the place. Gorkha Bhavan is located opposite the City Center Mall. As you enter the Mall through Nehru Road, the West Bengal run Tourist Bureau is in the large building on the right and next to the fountain. This is the same building where the Bellevue Hotel and Air India office are located. A board in front says "TOURIST BUREAU". This center also organizes sightseeing tours during the high tourist season. This is the main tourism center in Kolkata run by West Bengal State Government. Other than getting information, you can also make bookings from here for the state run tourist lodges including the one in Darjeeling. You will get information and booklets from here. 1) Check out Darjeeling Tourist Places to know about many other great sightseeing places.